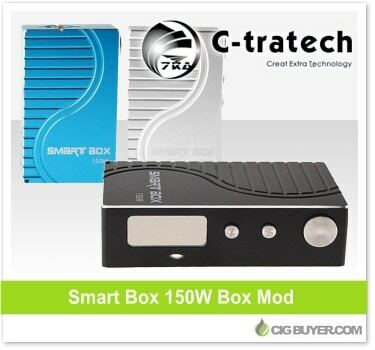 Several new box mods were recently released by Chinese manufacturer C-Tratech, including the largest and most powerful option the Smart Box 150w Mod. Variable wattage from 3 to 150W, it requires two high-drain 18650 batteries and will fire down to 0.2 ohms; meaning it’s sure to be a cloud producing beast! Although it doesn’t include temperature control, it has a 360° rotating screen and offers a variety of built-in safety features. It also includes an adjustable 510 center pin and magnetic battery door.